Let's play a game, shall we? 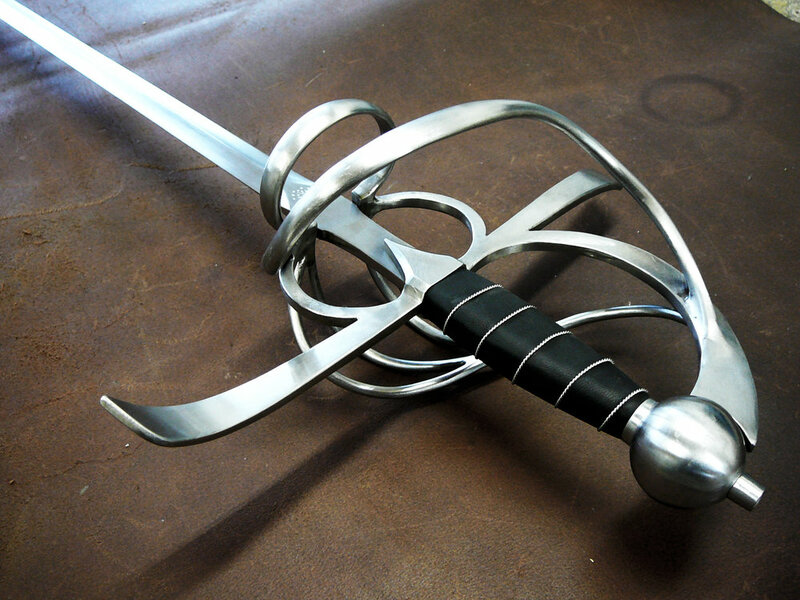 What is the better sword in a fight: longsword, katana, or rapier? My post about katanas has gotten some pretty interesting discussion, and it seems that my point that a rapier would defeat both a katana and a longsword in single combat is a bit contentious. I maintain that this shouldn't be a controversial stance at all. I think that when we look at history, it's clear that the rapier was the weapon of choice for the duel. Let's compare the three swords. I mentioned this before, but a katana is relatively short compared to a longsword. Rapiers are only a little bit longer than a longsword. Their relative difference in reach, however, is pretty significant due to the style in which they are wielded. The rapier's long, fast, single-handed lunge has a much better reach than either the longsword or the katana. The longsword isn't exactly known for being fast, but the katana definitely known for the iaijutsu quick-draw. So how would it fare against a rapier? Well, as an opener, this could definitely be effective, but a rapier is much faster during a fight. That fine point control makes for a brutally quick disengage and lunge. It has been suggested that rapiers could not defend effectively against other swords of the same historical period. Personally I think this is nonsense, if only because the Academie Duello Open Floor every Friday shows that proper steel rapiers are fine defensive weapons in their own right! Rapier swordplay emphasizes avoidance; it was a civilian weapon after all, and used by people who typically didn't wear armor in their daily lives. Steel weapons were not just for show, and, despite what Hollywood would like you to believe, one sword isn't going to cut through another. Here's the one area where the rapier just doesn't measure up. It's important to note that both the longsword and the katana were upper-class military weapons whose chief purpose was to kill effectively and efficiently. This isn't surprising as their evolution was driven by the needs of professional soldiers engaged in warfare. But rapiers were not intended for the battlefield. They were developed specifically for civilian use, for self-defense and for dueling, with the intention of wounding rather than killing outright. Rapier duels could still end in death, and many were deadly, but duels were usually decided by first blood, or by one fighter becoming exhausted or conceding. A rapier will strike first, and win the duel if the conditions allow it. But there is a world of difference between being stabbed by a rapier and taking a Mordhau to the face. Being stabbed by a rapier is survivable. Let’s be honest here, if we’re talking one-on-one duels, a samurai with a katana and a knight with a longsword are both going to get their asses kicked by the same person – someone who had the foresight to bring a sword heavily designed for duelling to the fight, i.e. a rapier. Swords are only as good as how well they fit their purpose, and I think it's clear that rapiers excel in their specific context. Are they the greatest swords ever, guaranteed to beat all the rest? No. But as long as everyone is obsessed with this one-upmanship of comparing one blade to another, it's worth pointing out that rapiers really are the best choice in single combat if the objective is to simply beat the other fighter, not kill them. They have all the advantages to avoid being hit and to wear down an opponent. Longswords and katanas were designed to kill, with the assumption (in the case of the longsword anyway) that its wielder would be wearing enough armor to take a few hits along the way. Something else that I had to mention in the comments of the other post is this: if the swordfighters of the 16th century had found that a longsword or katana type weapon was more effective in single combat, don't you think they'd have used that instead of wasting decades on refining their rapier techniques? I think it's a safe assumption that the rapier endured for so long (and eventually evolved into the smallsword etc) because it really was that damn good. So let's not take a crap all over rapiers, my friends. Remember, there is no such thing as a perfect sword, but there is such a thing as the perfect sword for the situation at hand.